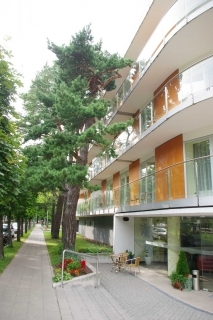 Luxury apartments in Palanga for your family! Maybe you have a dream of recreation in Palanga where charming pine-tree forests, perfect beaches and lovely sea soughing nostalgic melodies are waiting for you? High quality apartments that are only ten minutes away from the gorgeous Baltic Sea is just the thing you were looking for. Comfortable apartments “Jurgita” will accommodate up to four people. In the apartments of 46 m² that are for rent you will find a bedroom with bedclothes, a kitchen with a dinning room, a lounge with a comfortable couch, a bathroom, all the necessary domestic appliances and towels. There is a comfortable double bed with a good mattress in the sleeping room. In the kitchen you will find everything you need for preparing food, also flatware, various plates, pots, a frying-pan, a kettle and a fridge, so ice-creams and dishes you will make will not be a onetime pleasure. If you wish to taste something exclusive, just take a stroll and you will find yourself in the town’s centre that is only 200 meters away. A huge variety of restaurants, cafes and plenty of other entertainment for kids and adults await you there. But please do not forget that Palanga is not only about cafes and entertainment as a nourished palace of count Tiskevicius rests here, just like a gorgeous park, a unique Amber museum and many other places of interest. If you travel by your own or rent a car it would take you only several days to see the sights and you would have a possibility to enjoy the nature of Lithuania. Next to the apartments you will find a private, secure and convenient parking lot which territory is under video surveillance. When you will come back to your apartments after a long day you will have a possibility to spend a cozy evening watching television with a wide choice of TV channels, reading a book or having dinner in the dinning room where a table with four chairs is placed for your convenience. And if you will be willing to have a chat in a terrace, a table with chairs awaits you there. Apartments are in the ground floor, but the ground floor of this building is higher than ground floors of regular houses, so your privacy will not be disturbed and it will be very convenient for those traveling with children as it will be very easy to carry a perambulator to the apartments. If you cannot imagine travelling without more than one luggage you will be pleased to find even two spacious wardrobes for all of your clothes and hangers for your dresses and costumes. There is enough of place for your cosmetic in the spacious bathroom. There is also a washing machine, a shower-bath and a bidet for your convenience. If you wish to keep the apartment clean you will find all the necessary detergents. For those who will be willing to relax and forget about the housework we are offering cleaning services (more information here). Palanga is a resort where everyone will find its own entertainment, discover a favourite place in the nature and will spend some quality time with family or best friends. Additional services: guide services, wireless internet. For further information please contact us: tel. : +37068600028, e-mail: info@rentonline.lt Free calls via Viber are available as well.